[The day FTW published Part I of this important series we began to receive many messages deriding what was described as our propaganda on behalf of Fidel Castro. Patiently, I replied that this series had nothing to do with Castro or with "Communism". Both Korea and Cuba are "Communist" countries yet the Cubans are eating while the North Koreans are starving. That, I said, was the point - the only point. These issues are coming to center stage about a decade before "experts" had predicted they would and the problems they pose are being exacerbated by a global economic system which has found that "it may not be profitable to slow decline." Into this mix, we find that "Cuba has disproved the myth that organic agriculture cannot support a modern nation." And in terms of locally privatized agriculture we find a pure form of capitalism advocated by Catherine Austin Fitts (www.solari.com) that centers around neighborhood ownership, place-based financing and decentralized control. Further, the Cuban data shows that privately owned co-op farms are outproducing state-owned ventures. "The CCSs, made up of small, independent farmers, have outperformed the CPAs, the UBPC cooperatives and the state farms." I have been approached about going personally to Cuba next spring to view these developments for myself. I pray that this opportunity becomes realized. When I go, I will take with me all the protestations I have herd about how the Cuban people suffer under Castro, how unhappy the reportedly are, and how much they live without and I will balance these charges against the fact that the Cuban people are, healthy, educated, eating and surviving in a world we may all soon have to face. Recently CNN's Lou Dobbs broadcast a series showing that American food production is shrinking, while our population is increasing. Soon to end is the ability of the US and Canada (the only two nations to do so) to continue exporting grain to a hungry world. December 1, 2003, 1600 PDT, (FTW) --The story of Cuba begins in much the same vein as the story of North Korea. The collapse of the Soviet Union brought the loss of oil imports as well as the loss of their major trading partner. And U.S. sanctions kept the country isolated from the rest of the world. However, there are some very important differences between Cuba and DPRK. For one thing, Cuba has a much warmer climate, with a longer growing season. Cuba also has a better ratio of population to arable land, though most of the arable land is not of the best quality.1 Cuba has a large percentage of scientists, engineers and doctors in its population. With only 2% of the population of Latin America, Cuba holds 11% of the scientists in all of Latin America.2 Even before the crisis provoked by the collapse of the Soviet Union, Cuban scientists had begun exploring alternatives to fossil fuel-based agriculture. Research into ecological agriculture began back in the 1980s. By the time of the crisis, a system of regional research institutes, training centers and extension services was in place to quickly disseminate information to farmers.3 And finally, the Cuban government had social programs in place to support farmers and the population through the crisis and the transition into ecological agriculture. Before looking at the crisis and the Cuban response, it is necessary to look briefly at Cuban society before the crisis, particularly rural society and the agrarian reforms of past decades. It is here that the groundwork was laid for a successful transition. The province of Ciego de Avila encompasses what was formerly the Las Navajas estate. The estate had been owned by Alfredo and Horacia Arbutio, two brothers who ran their holdings with an iron fist. The brothers ruled over the local peasantry, and meted out a very harsh justice that included beatings and punishment for those who collected firewood on the estate. The peasantry had no schools, no healthcare, and no electricity. There weren't even roads to bring them these amenities. They were starved and sick. Members of the cooperative--sons and daughters of former sharecroppers--have university degrees in agriculture, computers, teaching, engineering and other subjects. The cooperative now supports a school, a clinic and a pharmacy. In the next generation, many children have plans to become doctors and nurses. And, considering that Cuba's medical training program is among the best in the world, it is highly likely that these plans will come to fruition. The Cuban revolution has been followed by three periods of agrarian reform, first in 1959, secondly in 1963, and finally the current land reform of the 1990s. The first reform limited private land owning to 1,000 acres. This resulted in a tripling of the number of small farmers and in the establishment of state farms to replace the large plantations. The second agrarian reform further limited private land ownership to 165 acres per person.8 The land reform of the 1990s would be more properly called a controlled privatization. We will discuss that later. The agrarian reforms succeeded because the government was truly intent on a redistribution of the wealth and a more equitable society. Farmers and cooperatives were supported with low-interest credit, stabilized prices, a guaranteed market, technological assistance, transport and insurance. The government also enacted laws that prevented the reconcentration of land, effectively preventing former plantation owners from slowly buying back their estates. The revolution took back control of Cuba from the U.S.; laws were enacted to ban foreign ownership of property. Cuba's isolation did, in fact, have some positive benefits in that it allowed them to affect their social transformation without outside intervention. And finally, the population was educated and provided with decent health care. By the 1980s, Cuba had surpassed most of Latin America in nutrition, life expectancy, education and per capita GNP. The literacy rate was an astonishing 96%, and 95% of the population had access to safe water.12 Cubans achieved a large degree of equity and industrialization through a trade regime that was highly import-dependent. However, because Cuban agriculture was overwhelming dedicated to sugar, tobacco and citrus, the country had to import 60% of its food, all from the Soviet bloc. Cuba also imported most of its oil, 48% of its fertilizer, 82% of its pesticides, 36% of its animal feed for livestock, and most of the fuel used to produce sugar.14 Although this system of imports and exports had allowed Cuba to modernize and raise the standard of living and the quality of life for all residents, its dependence upon the Soviet Union and the agricultural focus on sugar production left the country extremely vulnerable should anything happen to its major trading partner. from World Resources 2000-2001--People and Ecosystems: The fraying web of life. Two government policies are credited with preventing the crisis from reaching emergency levels: food programs targeting particularly vulnerable populations (the elderly, children, and pregnant and lactating mothers), and the food distribution ration card which guaranteed a minimum food provision for every citizen (albeit greatly reduced from former levels). This government-maintained safety net kept the crisis from reaching depths comparable to North Korea, while giving the country breathing space to redesign its agricultural sector to meet the challenge. The agrarian reforms of the mid-1990s were the key to recovering from the food crisis, but they could not have worked without the earlier agrarian reforms and without an educated and modernized peasantry unique in Latin America. The Cuban miracle is the product of a people with vision and solidarity. The Cuban economy had to recover from the loss of its closest trading partner, the Soviet Union. Cuban GNP has grown every year since 1995. There have been solid gains in employment, productivity and exports. 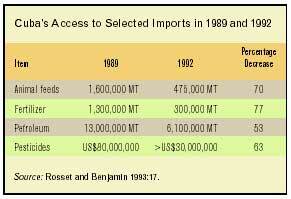 Fruit production has returned to its 1989 level (and even surpassed it in the case of plantains). Vegetables and tubers for domestic consumption have seen a prodigious increase in production. Food intake has climbed to 2,473 calories and 51.6 grams per person, a 33% increase over caloric intake in 1994.25 Observers the world over have pronounced the Cuban efforts a success. Single handedly, without help from either the World Bank or the IMF (and in total contrast to the normal World Bank and IMF reform policy), Cuba has disproved the myth that organic agriculture cannot support a modern nation. Agrarian reform in the 1990s centered on a new system of sustainable agriculture, the development of healthy markets, and the privatization and cooperatization of the unwieldy state farms. For decades, scientists had been aware of the negative effects of industrialized agriculture. Soil erosion and mineral depletion had been a marked problem in Cuba. Before the crisis of the 1990s took place, scientists had already developed organic and ecological methods of farming. Following the crisis, the Cuban government embraced these new methods and promoted them with new agrarian policies. The large state farms were incompatible with this new paradigm. Agroecological farming simply does not work on a large farm. In industrial farming, a single technician can manage thousands of acres without intimate knowledge of the land he is overseeing. A few random observations will provide him with all the input he needs to write out instructions for the application of a particular fertilizer formula or pesticide to be applied with machinery over the entire area. However, in agroecological farming, the farmer must be intimately familiar with every patch of soil. The farmer must know where to add fertilizer, and where pests are harboring or entering the field. Smaller farms were easier to manage, and more compatible with sustainable agriculture. Although the government retains ownership of the land, the UBPCs are granted a free lease to the land. The government then contracts with the UBPCs on which crops to grow and the amounts. On the basis of these contracts, the government sells the necessary agricultural inputs to the UBPCs. The new system has not been enacted without problems. Most notably, there is friction between the UBPCs and the local officials of the Ministry of Agriculture, who still behave as though they are in control of the cooperatives. However, the trend is clearly heading toward greater autonomy for the cooperatives. The holdings of private farmers have also grown in the last decade. Since 1989, the government has turned over nearly 170,000 hectares of land to private farmers.29 Although the government retains title to the land, private farmers and CPAs can farm the land rent-free for an indefinite period of time. Many Cubans now view farming as an opportunity. Many families have left the cities to become farmers. The ANAP claims that its membership expanded by 35,000 from 1997 to 2000.30 The new farmers tend to be young families (many of them college educated), early retirees, or workers with a farming background. Neighborhood gardens and community horticultural groups not only produce food for their members, they donate produce to schools, clinics and senior centers, and still have enough excess produce to sell in the neighborhood. Neighborhood markets sell produce at well below the cost of the larger community markets, providing fresh vegetables for those who cannot afford the higher prices. By the beginning of the year 2000, there were 505 vegetable stands functioning, with prices from 30% to 50% of the prices at farmers' markets. Recognizing the potential of urban agriculture, in 1994 the government created an urban department in the ministry of Agriculture. The Urban Agriculture department formalized growers' claims upon vacant lots and legalized the growers' rights to sell their produce. The department has acted to support and promote urban agriculture without attempting to impose its authority upon the movement. Laws require that urban produce be completely organic, and ban the raising of livestock in urban areas. Resolution 527/97 provides all residents with up to one-third of an acre of vacant land on the edge of the major cities. By the beginning of the year 2000, more than 190,000 people had applied for and received these personal lots.33 The government has also opened a number of neighborhood agricultural stores to supply organic inputs and extension services. In the month of October, 1994, the Cuban government opened 121 agricultural markets throughout the country.36 An immediate consequence was that the black market in basic food items virtually disappeared. Food prices in the open market were a good deal less than the black market. The free markets also quickly demonstrated that they led to increased production and spurred higher quality and greater diversity in produce. However, over time, supply and demand pricing did result in rising food prices. By the year 2000, food purchases could take up as much as 60% of the average Cuban salary. The poor and the elderly turned to urban vegetable stands offering produce from urban gardens. To combat this problem, the Ministry of Agriculture is giving used trucks to private cooperatives to allow them to bypass the distributors and ship their goods directly to market. The remaining state farms are also selling their produce at low prices in state agricultural markets, in an effort to drive down prices. The experiment in free agricultural markets has shown that there must be some government controls on price gouging and collusion. 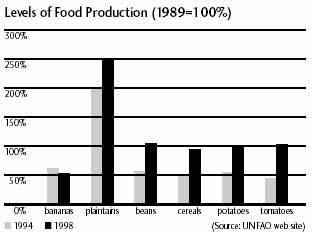 · Production of tubers and plantains more than tripled from 1994 to 1999. · Vegetable production doubled from 1994 to 1998, and then doubled again in 1999. · Potato production increased 175% from 1994 to 1998. · Cereal production rose 183% from 1994 to 1998. · Bean yields increased 60% from 1994 to 1999. Comparing food production to 1989 levels is not quite so favorable, but still impressive. Animal protein production still remains close to depressed 1994 levels. This is partially because the market reforms do not apply to meat, eggs and milk, which are not easily sold in farmers' markets. Likewise, the agroecological model is not so easily applied to animal production. But the biggest factor keeping animal protein production down is the fact that the transition from industrial animal breeding to sustainable, ecologically feasible animal breeding must proceed at a much slower pace than the similar transition in agriculture. Exports are still considerably lower than 1989 levels. Only citrus exports have reached the 1989 level. Coffee and tobacco exports still lag behind, and sugar exports are only a fraction of 1989 levels.41 In the case of sugar production, U.S. embargoes and the low price of sugar on the world market are acting to keep sugar production depressed. But the Cuban government is formulating plans to increase sugar exports in the effort of bringing in much needed foreign revenue and investment. Aside from restoring export levels and animal protein production, the future of the new Cuban agricultural model faces three challenges: reconciling price distortions between the U.S. dollar and the Cuban peso, reconciling state control and private initiatives, and overcoming limits to the ecological model. Concerning this latter challenge, agroecological farming requires more land and more labor than industrial farming. While Cuba does have the land base to continue agricultural expansion, rural areas have experienced a labor shortage. Only 15% of the Cuban population lives in the countryside.42 The agricultural sector has been able to reverse the rural-to-urban migration and attract the necessary workforce, but nobody is certain how long this reversal will continue. And then there is the uncertain balance between farm labor requirements, the higher caloric intake necessary for busy farmhands, and agricultural production. The new Cuban model of agriculture faces many challenges, both internally and externally, but that does not diminish its current success. And there are many analysts who feel that the Cuban experiment may hold many of the keys to the future survival of civilization. The World Bank has reported that Cuba is leading nearly every other developing nation in human development performance. Because Cuba's agricultural model goes against the grain of orthodox economic thought, the World Bank has called Cuba the "anti-model." Senior World Bank officials have even suggested that other developing countries should take a closer look at Cuba.43 This despite that fact that the Cuban model flies in the face of the neoliberal reforms prescribed by both the World Bank and the IMF. Indeed, currently the fastest growing Cuban export is that of ideas. Cuba now hosts a number of visiting farmers and agricultural technicians from throughout the Americas (excluding the U.S.), and elsewhere. Cuban agriculture experts are currently teaching agroecological farming methods to Haitian farmers. Ecologists as well as agricultural specialists are finding great promise in the idea that biodiversity is not just a conservation strategy, but production strategy. As declining fossil fuel production impacts civilization, Cuba may find itself in a position to help lead the world into sustainable agriculture. Currently, few countries are willing to invest in human capital and infrastructure the way that Cuba has, but hopefully this will change in the years ahead. Resistance to Cuban-style agricultural reform would be particularly stiff in the United States. Agribusiness will not allow all of its holdings and power to be expropriated. Nor is the U.S. government interested in small farms and organic agriculture. The direction of U.S. agriculture is currently towards more advanced technology, greater fossil fuel dependency, and less sustainability. The ability of small farmers and urban gardens to turn a profit is effectively drowned out by the overproduction of agribusiness. However, now is the time for people to study agroecology (and permaculture as well), with an eye towards implementing this technology, once declining fossil fuel production sparks a crisis in industrial agriculture. Our survival will depend upon our ability to implement these ideas once the current technology has failed. The North Korean example shows that the alternative is unthinkable. 5 Household Incomes in Cuban Agriculture: A Comparison of the State, Co-operative and Peasant Sectors, Deer, C. D., et al. In Development and Change, Vol. 26. Blackwell Publishers, 1995. 16 Op. Cit. See note 12. 17 Op. Cit. See note 15. 18 Op. Cit. See note 12. 20 Op. Cit. See note 15. 22 Op. Cit. See note 12. 23 Op. Cit. See note 15. 24 Op. Cit. See note 12. 26 Op Cit. See note 12. 27 Op. Cit. See note 25. 38 Op. Cit. See note 12. 43 "Learn from Cuba," Says the World Bank. Interpress Service, 5/1/2001.